Activist Hassan Karajah(33) was kidnapped from his home in the village of Safa in the Ramallah district of West Bank on September 11th by Israel’s occupation forces. On Monday October 8th he returned – in hand-cuffs, led in a chain and dressed in the garb of an Israeli soldier by his captors raiding his home. The Israeli occupation forces’ soldiers went on to search his home and verbally abuse his relatives, physically attack his brother Muhammad and interrogate his wife. When the occupation forces withdrew, taking the hand-cuffed Karajah with them, his brother Muhannad was able to take several photographs of the long-time non-violent activist who has been imprisoned three times by the Israeli occupation. Hassan Karajah has worked as a Youth Coordinator in the Stop the Wall -campaign and in support of the BDS movement and served as Ambassador of Arab Youth to the Arab League. He has been imprisoned for a total of 40 months by the Israeli regime, first 2013-14, then 2016-17 and now for almost a month. Karajah’s twin daughters were born in the autumn of 2016 two months after his kidnappingand imprisonment by Israeli occupation, which forbid his wife from visiting him through his imprisonment without charge or trial back then. One of the martyrs still unidentified. Israeli occupation snipers killed six peaceful Palestinian protesters and wounded 112 others near the eastern side of Gaza Strip, Palestinian ministry of health has announced in a statement. According to the statement, five of the martyrs were identified as Ahmad al-Taweel, 27, from Al-Nusairat Refugee Camp and Mohammad Ismail, 29, from Al-Burij Refugee Camp, Abdullah al-Daghma, 25, Ahmad abu-Naim, 17, and Afifi Afifi, 18. The statement said that the martyrs were shot with live ammunition in the upper extremities of their bodies. Meanwhile, the statement said, 85 out of the 112 wounded were admitted to hospitals, noting that nine of them suffered serious wounds. Since the start of protests on March 30, Israeli occupation forces have killed 201 Palestinian protesters and wounded more than 21,500 others. The Palestinians protest against the strict 12-year-old Israeli blockade imposed on Gaza Strip and to reinforce the right of the Palestinian refugees to return to their homes occupied in 1948. A recent report revealed that the number of applications made by Israelis to obtain permits to carry personal weapons increased during the past two months by 183 per cent compared to the same period of last year. The increase in the number of requests for permits to carry weapons came following Public Security Minister Gilad Erdan’s decision to ease regular restrictions imposed on that sort of security authorisations, Haaretz newspaper reported Thursday. In August, Erdan announced the ministry’s resolution to simplify the permits granting procedure for Israelis, particularly in areas close to the zones populated by Palestinians and to the border. Since then, 2,800 Israeli citizens have applied for permits to carry weapons, which marked a 183 per cent increase compared to the same period of last year. Haaretz asserted that the initial estimates made by the Ministry of Public Security indicated that 35,000 to 40,000 people would apply to obtain permits to use weapons. Lorde is not the only artist to cancel an appearance in Israel and support the BDS movement. Others include Shakira, Brazilian singer Gilberto Gil and Lauryn Hill. A number of other artistsalso pulled out of this year’s Meteor Festival, with a total of 15 bands heeding BDS’ call to withdraw from the event. GAZA, PALESTINOW.COM — The Palestinian Health Ministry in Gaza said that a total of 198 Palestinians, including 37 minors, had been martyred by Israeli forces, and 22,000 others injured since the start of mass demonstrations in March against Israeli occupation. Israeli forces continued with systematic crimes, in the occupied Palestinian territory (oPt), for the week of 04 – 10 October, 2018. Israeli forces continued to use excessive force against unarmed civilians and peaceful protestors in the Gaza Strip and West Bank. 3 Palestinian civilians, including a child and a person with disability, were killed. 239 civilians, including 41 children, 3 women, 4 journalists and 6 paramedics, were wounded; 7 of them sustained serious wounds. 6 Palestinian civilians, including a child, were wounded in the West Bank. Israeli forces continued to use lethal force against Palestinian civilians, who participated in peaceful demonstrations organized within the activities of the “Great March of Return and Breaking the Siege” in the Gaza Strip, which witnessed for the 28th week in a row peaceful demonstrations along the eastern and northern Gaza Strip border area. During the reporting period, the Israeli forces killed 3 Palestinian civilians, including a child and a person with disability, and wounded 239 civilians, including 41 children, 3 women, 4 journalists, and 6 paramedics. The injury of 7 of them was reported serious. Mroeover, a Palestinian fisherman was wounded in the northern Gaza Strip. In the West Bank, 6 Palestinian civilians, including a child, were wounded. In the Gaza Strip, on 05 October 2018, the Israeli forces killed 3 Palestinian civilians, including a child and a person with disability. Fares al-Sersawi (12), from al-Shija’iyah, and Mahmoud Abu Sam’an (20), from al-Nussairat, were shot dead after being hit bullets to the chest while participating in the demonstration organized in eastern al-Zaytoun, east of Gaza City. Moreover, Hussein al-Regeb (19), from Bani Suhailah, was killed after being with a bullet to the abdomen while he was 70-100 meters away from the border fence in eastern Khuza’ah, east of Khan Younis. It should be mentioned that the latter killed was a person with Birth Defects and suffered cerebral atrophy in addition to other health problems in the abdomen. As part of the use of lethal force against the peaceful protestors along the border fence during the reporting period, Israeli forces wounded 239 civilians, including 41 children, 3 women, 4 journalists and 6 paramedics. Seven of them sustained serious wounds. As part of targeting Palestinian fishermen in the Gaza Sea, the Israeli forces continued to escalate their attacks against the Palestinian fishermen, pointing out to the ongoing Israeli policy of targeting their livelihoods. On 06 October 2018, the Israeli authorities decided to reduce the area allowed for fishing to 6 nautical miles along the Gaza Strip shores as part of the Israeli policy to restrict fishermen and targeted their livelihoods. During the reporting period, the Israeli forces opened fire 4 times at the fishermen; 3 incidents in the north-western Beit Lahia and 1 off Rafah shore in the southern Gaza Strip. As part of the Israeli airstrikes, on 05 October 2018, the Israeli helicopters targeted a border-control point belonging to al-Qassam Brigades in the southern Return encampment, east of Jabalia in the northern Gaza Strip and completely destroyed it. On 07 October 2018, an Israeli drone launched a missile at a group of civilians who were in eastern al-Shokah village, east of Rafah City in the southern Gaza Strip. However, no casualties were reported in both airstrikes. In the West Bank, the Israeli forces during the reporting period wounded 6 Palestinian civilians, including a child. As part of the Israeli house demolitions and notices, on 08 October 2018, Ayman Kawazbah self-demolished his house in Beit Hanina village, north of occupied Jerusalem to avoid paying a fine of NIS 40,000 to the Israeli municipality. The house was built 10 years ago and the owner has recently attempted to obtain a building license from the competent authorties but in vain. The Israeli municipality also imposed on him a construction fine of NIS 36,000. The house sheltered 8 persons, including 6 children. As part of demolition of houses and other civil objects, on 09 October 2018, the Israeli forces demolished 3 dwellings in al0-Halawah area in al-Masafer area, southeast of Yata in southern Hebron, and confiscated solar panels which were supplying the dwellings with electricity. The dwellings belonged to the families of Jebril, Abu ‘Aram, ‘Alia Abu ‘Aram and Yaser Abu ‘Aram, and sheltered 19 individuals, including 13 children. As part of the Israeli settlers’ attacks against the Palestinians civilians and their property, the fieldworkers in the West Bank reported 9 attacks. On 05 October 2018, the fieldworkers reported 3 attacks; 2 in Salfit and 1 in Qalqiliyah, against the Palestinians farmers who were picking olives. On 06 October 2018, 3 settlers from “Kedumim” settlement, east of Qalqiliyah, attacked a taxi car belonging to Rafi Taxi Company in Nablus. The settlers threw a stone at the car; as a result, the stone hit the front window and broke it while the driver ran away. On 08 October 2018, the settlers broke the windows of 10 vehicles parked in al-Rayan Auto Showroom and punctured the tires in Budia village, west of Salfit. On 09 October 2018, the settlers uprooted 39 fruitful olive and almond trees in Burqin village lands, west of Salfit, and leveled lands there. On 10 October 2018, a group of settlers from “Shillo” settlement attacked Qaryout village, southeast of Nablus. The settlers wrote hostile slogans against Arabs ad Muslims on the house walls of Mohammed Badawi and the New Village Mosque. They also graffiti-sprayed the Star of David on the back of a car belonging to ‘Abdul Naser Badawi and slashed with sharp tools the tires of 8 cars. They also broke windows of 4 houses and a car in ‘Orif village, south of the city in a similar attack. On Friday evening, 05 October 2018, thousands of Palestinian civilians swarmed to the Return encampments established by the Supreme National Authority for the Great March of Return and Breaking Siege, east of Abu Safiyah Hill in the northern Gaza Strip, east of Malakah intersection, east of Gaza City, east of al-Buraij in the central Gaza Strip, east of Khuza’ah village, east of Khan Younis, al-Shawkah village, east of Rafah in the southern Gaza Strip. Hundreds of them approached the border fence between the Gaza Strip and Israel, set fire to tires as a number of them attempted to throw stones at Israeli forces. The Israeli forces opened fire and fired tear gas canisters at them. As a result, 3 civilians, including a child, were killed. Moreover, 169 civilians, including 28 children, 3 journalists and 3 paramedics were wounded. In Gaza City: Israeli forces killed 2 civilians, including a child, namely Fares Hafeth Abdul ‘Aziz al-Sersawi (12), from al-Sheja’eiyah neighborhood, was hit with a live bullet to the chest, and Mahmoud Akram Mohammed Abu Sam’an (20), from al-Nuseirat, was hit with a live bullet to the chest. Moreover, 56 civilians, including 3 children, were wounded. Forty four of them were hit with live bullets and their shrapnel and 12 were hit with tear gas canister. Khan Younis: Israeli forces killed Husein Fathi Husein al-Raqab (19), from Bani Suheila, east of Khan Younis, after he sustained a live bullet wound the abdomen when he was about 70-100 meters away from the border fence, east of Khuza’ah village. It should be noted that Husein was with special needs as he suffered congenital malformations since birth, atrophy in the brain and health problem in the abdomen. Moreover, 16 civilians, including 4 children and Doa’a Farid Hamed Zu’rob (25),a journalist at Noor News Network from Khan Younis, and Mohammed Nidal Jom’ah Abu ‘Asi (26), a volunteer paramedic at Rowad al-Salam Team from Bani Suheilah, east of the city was hit with a live bullet to the chest and doctors classified his injury as serious in addition to 3 other civilians. The Northern Gaza Strip: 54 civilians, including a child, 2 paramedics and 2 journalists were wounded. Forty three of them were hit with live bullets and their shrapnel and 11 were hit with tear gas canisters. the 2 wounded journalists were identified as Mohammed ‘Essa Khalid Ramadan al-Aswad (21), a reporter at Palestine News Agency was hit with a live bullet to the left foot and Mohammed Hazem Sami al-Masri (20), a freelance journalist was hit with a tear gas canister to the head. The wounded paramedics were identified as Tasneem Fathi Ahmed Hammad (20), a volunteer paramedic at the Palestinian Ministry of Health was hit with a tear gas canister to the right foot, and Mohammed Samir Mohammed al-Za’anin (30), a volunteer paramedic at Nurse Volunteer Tear was hit with a tear gas canister to the head. The Central Gaza Strip: 16 civilians, including 6 children, were hit with live bullets and their shrapnel during their participation in the demonstration that was organized in the east of al-Buraij. Rafah City: 17 civilians were hit with live bullets and their shrapnel and 3 were hit with tear gas canisters. doctors classified 2 civilian’s injury as serious. On Saturday, 06 October 2018, a 20-year-old civilian was hit with a tear gas canister to the right arm during his participation in the March of Return and Breaking Siege activities, east of al-Shawkah village, east of Rafah in the southern Gaza Strip. 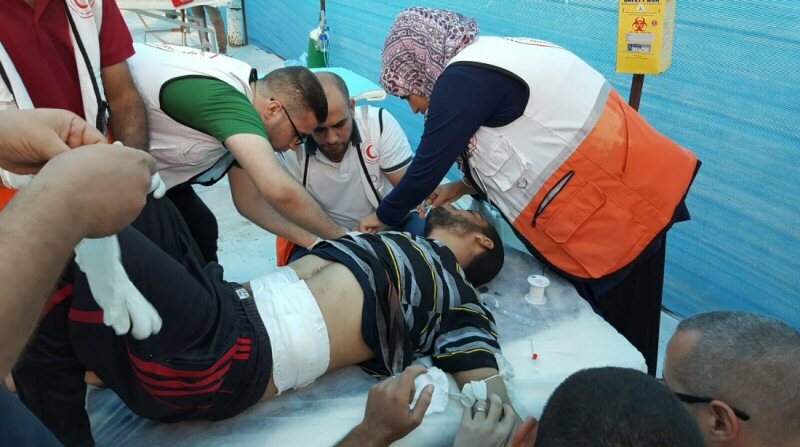 On Sunday, 07 October 2018, a 23-year-old civilian from al-Buraij was hit a live bullet to the lower limbs during his participation in the March of Return and Breaking Siege activities, east of al-Buraij in the central Gaza Strip. Habibah Mahmoud Abdul ‘Aziz al-Sekafi (22), a volunteer paramedic at the Palestinian Ministry of Health from Beit Lahia was hit with a tear gas canister to the left foot. At approximately 02:00 on Thursday, 04 October 2018, Israeli forces moved into Ras al-‘Amoud neighborhood, east of occupied East Jerusalem’s Old City. They raided and searched a house belonging to Malek Jawdat Abu Isninah (21) and then arrested him. At approximately 04:00, Israeli forces moved into Bab Hattah neighborhood in occupied East Jerusalem’s Old City. They raided and searched a house belonging to Hamza Mohamed Abu Nanb (15) and then arrested him. At approximately 19:00 on Friday, 05 October 2018, Israeli forces moved into Hizmah village, northeast of occupied East Jerusalem. They raided and searched houses in the eastern neighborhood. Meanwhile, a group of Palestinian young men gathered and threw stones and empty bottles at the Israeli soldiers, who immediately fired live and rubber bullets, tear gas canisters and sound bombs at them. As a result, an 18-year-old male was hit with a live bullet to the thigh and then taken to the hospital for treatment. At approximately 02:00 on Sunday, 07 October 2018, Israeli forces moved into al-‘Issawiyia village, northeast of occupied East Jerusalem. They raided and searched houses, from which they arrested Qusai Jamal Abu ‘Ali (16), Ghannem Kamal Mostafa (37) and Mostafa ‘Emran Mostafa (28). At approximately 16:30 on Monday, 08 October 2018, Israeli forces arrested Su’ad Rushdi Abu Romouz (44) and her brother Jawad (44) after an Israeli settlers attacked them in Baten al-Hawa neighborhood in Silwan village, south of occupied East Jerusalem’s Old City. Nazem Abu Romouz said that an Israeli settler attacked his siblings Jawad and Su’ad in Baten al-Hawa neighborhood and pepper sprayed at his sister’s face. He added that the Osraeli police arrived at the area and arrested his siblings instead of arresting the attacker. The police then took his siblings to Salah al-Deen Police Station in occupied Jerusalem. It should be noted that few hours after interrogating them, they were released on bail at approximately 00:00 on condition that they will attend to the court hearing. At approximately 06:00 on Tuesday, 09 October 2018, Israeli forces moved into al-Wad neighborhood in occupied East Jerusalem’s Old City. They raided and searched a house belonging to Mahmoud ‘Abed al-Wahab Sa’ied ‘Abed al-Latif (27), and then arrested him. At approximately 01:00 on Wednesday, 10 October 2018, Israeli forces moved into Abu Dies village, east of occupied East Jerusalem. 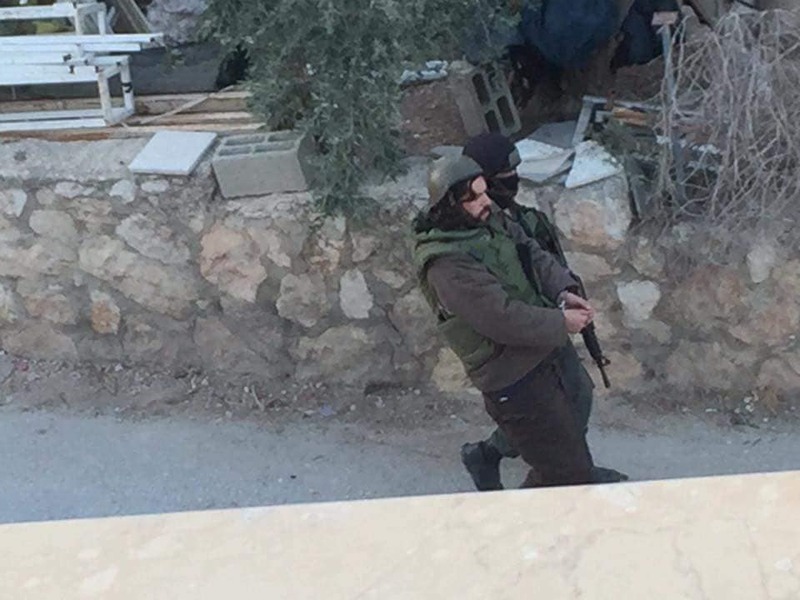 They raided and searched a house belonging to Laith Sami ‘Awwad (24) and then arrested him. On Monday, 08 October 2018, Ayman Kawazbah self-demolished his house in Beit Haninah village, north of occupied East Jerusalem, to avoid paying demolition costs to the Israeli Municipality. Ayman said that on Monday morning, he self-demolished his house after vacating its contents to avoid paying demolition costs to the Israeli Municipality, which is estimated at NIS 40.000. He also said that his house was built 10 years ago and during the past days he attempted to license his house, but in vain. He added that the demolition decision issued after building the house and living in it. He managed to delay the demolition many times. It should be noted that the Israeli Municipality imposed a fine on him estimated at NIS 36.000. Despite paying the fine, the final demolition decision was issued. The house was sheltering 8 members, including 6 children. On Monday, 08 October 2018, the Israeli authorities handed the residents of Khan al-Ahmar Bedouin Community, east of occupied East Jerusalem, a notice to level a dirt road and in order to facilitate the movement of Israeli vehicles as a prelude to evacuate and demolish the community. ‘Abdullah Abu Rahma, Coordinator of the Popular Committee Against the Wall and Settlements, said that the Israeli forces handed the community residents notice to level a dirt road and gave them one week to challenge the notice. This decision coincides with the continuation of a sit-in organized by the Palestinian and international solidarity activists for 111 days in row, rejecting the Israeli decision of demolishing the community and displacing its residents. It should be noted that the time given by the Israeli authorities to Khan al-Ahmar Bedouin Community to vacate and self-demolish their houses ended on 01 October 2018. On 05 September 2018, the Israeli Supreme Court refused a petition against evacuating and displacing the residents of Khan al-Ahmar Bedouin Community and issued a decision to demolish it and agave them one week to implement the decision. Kherbit al-Halawa is located in Masafer Yatta area, south of Yatta, where civilians live in residential tents and houses built of bricks and roofed with tin plates. Kherbit al-Halawa is surrounded by al-Fakhit from the northern side, Kherab al-Majaz, al-Taban and al-Fakhit from the eastern side, Kherab al-Markaz, Janbah and Bir al-Nawa’mah from the western side, and the annexation wall from the southern side. Kherbit al-Halawa is classified within the Israeli authorities’ decision to transfer it to military training sites under the so-called 918 area, where civilians were banned to presence there. The Kherbit al-Halawa is built on an area of 12 dunums, sheltering 9 families, including 120 member. At approximately 13:50 on Friday, 05 October 2018, a group of Israeli settlers from “Prokhin “ settlement, west of Salfit, entered Palestinian civilians’ lands and attacked the family of Ashraf Tahseen ‘Othman, from Kafur al-Deek village, while harvesting olive trees in their lands near the abovementioned settlement. The Israeli settler prevented the Palestinians from continuing their work. After that, the Israeli forces intervened and kept the settler away from the area. On the same day, Israeli settlers, from “Rafava“ settlement, carried out another attack against Mohamed Jameel Souf (28), from Hares village, northwest of Salfit, and severely beat him while he was in his agricultural land in Wadi al-Shami area, west of the village. The Palestinian Red Crescent Society provided first aid to him and then took him to Yaser ‘Araft Hospital in Salfit. 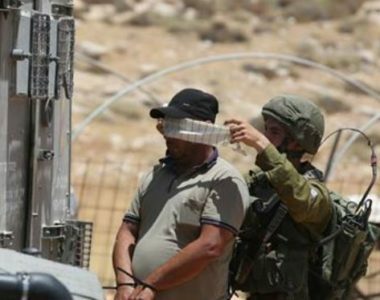 At approximately 22:20 on Friday, a group of Israeli settlers entered lands belonging to Fir’itah village, north of Qalqiliyia, deported Palestinian farmers from their lands and prevented them from harvesting the olive trees. At approximately 02:30 on Monday, 08 October 2018, a group of Israeli settlers attacked Bidiya village, west of Salfit, and broke the windows of 10 vehicles parked in al-Rayan car showroom and then punctured their tires. The car showroom belongs to the siblings Mohamed and Ahmed Khadir Rayan. At approximately 09:00 on Tuesday, 09 October 2018, a group of Israeli settlers from “Prokhin “ settlement, entered Palestinian civilians’ lands belonging to Burqeen village, west of Salfit, located adjacent to the bypass road. The settler uprooted around 39 olive and almond fruitful trees planted 2-20 years ago. The trees belong to Jamal ‘Othman Salama, from Burqeen village. At approximately 03:00 on Wednesday, 10 October 2018, a group of Israeli settlers, from “Shilo “ settlement, attacked Wad al-Bir area, southeast of Qaryout village, southeast of Nablus. The Israeli settlers attacked Palestinian civilians’ vehicles parked in front of their owners’ houses and then wrote hostile slogans against Arabs and Muslims on the house walls of Mohamed Hamad Badawi and on the walls of the village’s new mosque. They also drew the David Star on a vehicle belonging to ‘Abed al-Naser Hamad Badawi and punctured the tires of 8 vehicles belonging to ‘Abed al-Naser Badawi, Mohamed Hamad Badawi, Sufyan Shehada Ahmed Moqbel, Rami Dieb Mahmoud, Yousef Mohamed Hasan Moqbel, Mohamed Rezeq Kassab, and Shehada Ahmed Moqbel. Sameer Mohamed Mohamed Sawalmah: breaking 2 windows in the second floor in northeastern side of a 2-storey house and breaking a Renault car windows. Ahmed ‘Abed al-Kareem Fayiz shahada: breaking 2 windows in the first floor in the eastern side of the house, which is under-construction. ‘Aziyah Mahmoud Ahmed ‘Ali, whose house is rented by Raied Shehada: breaking 6 windows of the house, which is comprised of one floor. Raied Mahmoud Sabbah: falling stones in his house yard without causing any material damage. 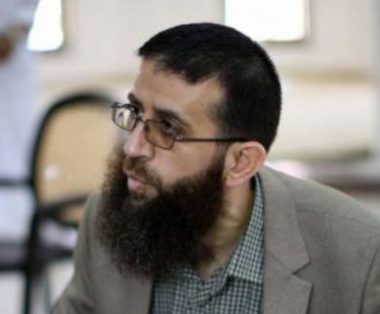 The Palestinian Prisoners’ Society (PPS) has reported that detainee Khader Adnan is ongoing with the hunger strike he started 40 days ago, protesting his continued imprisonment. The detainee, from Arraba town, south of the northern West Bank city of Jenin, started the strike on September 2nd, and has been denied visits with his lawyer since September 17th. He has been frequently placed in solitary confinement, while the Israeli prison authority also confiscated his books, pens, paper, radio and newspapers, in addition to preventing him from communicating with other detainees. His wife said that Adnan stated in a letter, which was smuggled from prison, that he is facing serious health complications, and cannot move around without a wheelchair. In addition, human and prisoner rights groups in Palestine have called on the Red Cross to intervene, and pressure Israel into abiding by International Law and all related human rights treaties. Adnan has previously held two major hunger strikes; one was a 66-day long hunger strike, in 2012, and another lasted 55 days, in 2015, in protest of his administrative detention, without charges or trial. He is considered a senior political leader of the Islamic Jihad movement in occupied Palestine.